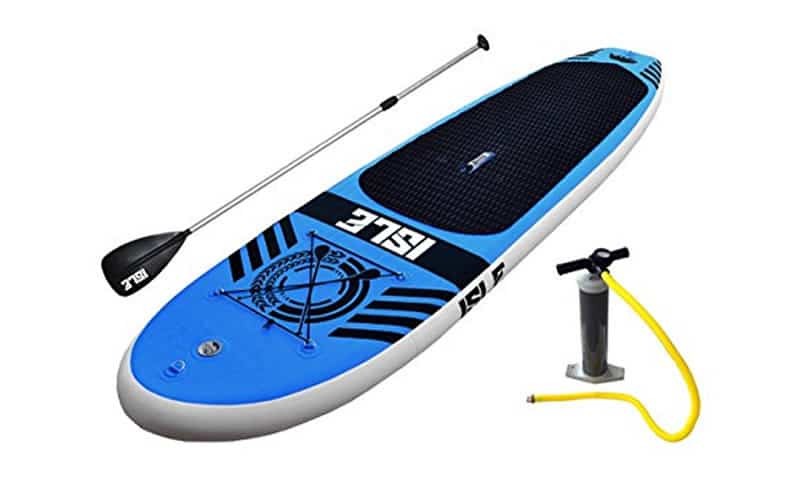 At under $500, the Solstice Bali 10’8” Stand-up Paddleboard (SUP) manages to beat out even some of the most affordable inflatable SUPs on the market, while still offering great quality and pretty impressive package. We consider this a high-quality affordable board for beginning and even intermediate riders. The Solstice Bali comes with a pump and carry bag, and like all inflatable stand-up paddle boards, it’s a great alternative to rigid paddle boards. As always, in the question of inflatable vs. hard paddle boards, we warn you not to underestimate the inflatables! Once pumped up, this board is hard to differentiate from a hard board. And of course, the ability to deflate it and pack it away after riding makes for convenient transport and storage. So why is this board so low-cost compared to its competitors? We were glad to find that you’re really not sacrificing too much at all for the low cost of this board. 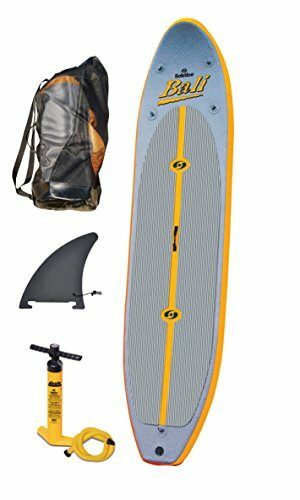 The most important thing to note — this board does not come with a paddle, like many other inflatable SUP packages (a good paddle will cost you about $60). At 4” thick, it’s a bit thinner than some of the leading inflatables, like the Tower Adventurer 9’10” and the Isle Airtech 10’ Inflatable — if you’re able to jump about $200 more, we encourage you to take a look at those boards. Otherwise, the Solstice Bali has all the basic gear you need (minus the paddle!) and is a very durable, solid board. There’s a reason this board is one of the most popular inflatable stand up paddle boards out there. The Solstice Bali is made with 1000 denier 3 ply PVC reinforced material, and reviewers of all sizes say they’ve had no problems with flexing or bending of the board. As mentioned, the 4” thickness is a bit less than some of the boards at the next price point — but at 10’8” long and 32” wide, the Bali has very adequate width and pretty substantial length, to make for a very stable ride for any beginner. 32” width makes for a sturdy, stable ride. Large, non-slip traction top pad. 4 stainless tie-downs for securing gear. Tri-fin setup, with removable center fin. Includes carry bag, pump & gauge. Folds down to 32” inches (like a rolled sleeping bag) for storage. Material: 1000-Denier 3-ply PVC material and double overlap drop stitch construction — super durable! This thing will hold up better than many hard boards! Inflating: Inflate to 12-15 PSI with included pump. Set up: Pretty standard, low-hassle setup. Just pump it up and jump in (or on, rather) the water. There are two fixed fins and one removable fin. Some reviewers have complained that it’s a bit tough to inflate this board. There are four stainless steel tie-downs for securing any gear you might be bringing, and a d-ring in the rear for attaching an optional ankle leash. The Ride: This board is sturdy and dependable, even for the most beginner of riders. No bending or flex, as long as you pump it up to the recommended PSI. 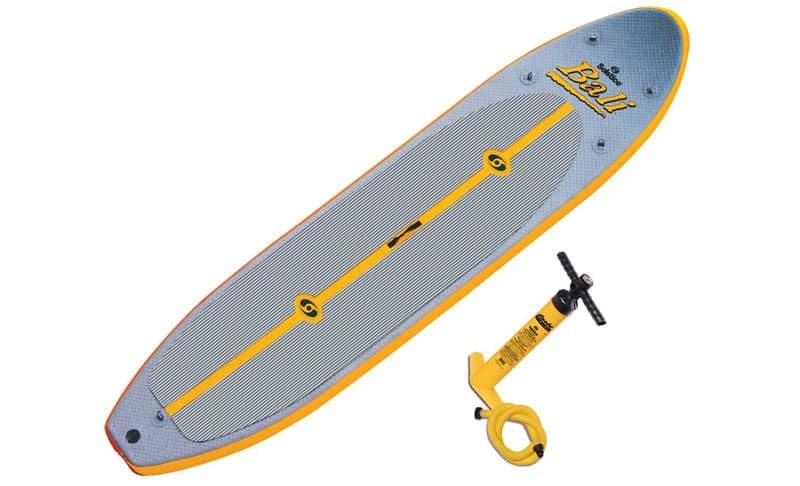 Take this out on the lake or river, or even in small waves. And don’t worry about running the Solstice Bali up on the rocks — the PVC will not tear. Price!! You will not find a cheaper board without taking a serious loss in performance. Super durable, great multi-layer construction. Great grip on the deck pad. Not too bad on style. Can be somewhat difficult to inflate. Included pressure gauge is sometimes inaccurate. No included paddle (plan on spending an extra $40-$60). Price: 110% – Yeah, this board is very, very affordable, especially for the quality you’re getting. Material: 95% – Nothing to worry about with this multi-layer PVC. A small ding for complaints about the pressure gauge. Design: 80% – For the low price tag, you’ve gotta sacrifice something: the board is a bit thinner than its closest competitors, and it doesn’t come with a paddle (we’ll call that a “design flaw”). Overall: 95% – For those on a budget, the super-competitive price point more than makes up for the slight design drawbacks and the $40-$60 you’ll have to spend on a paddle. We like this board because it is among the absolute most affordable stand-up paddle boards, and it is still quite high quality and very rideable. For under $500, the Solstice Bali is the board to get for beginning stand up paddlers looking to get on the water without making a huge investment. As noted, we’re a little annoyed that they don’t include a paddle, but even with the extra $40-$60 you’ll spend on a good paddle, you’ll still come out spending much less than you would on the inflatable stand up paddle boards at the next level up. 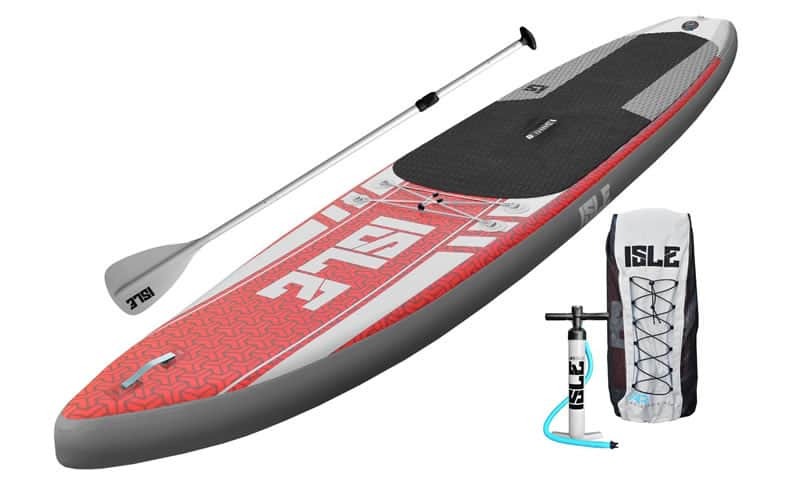 Again, if you are ready to throw down an extra $200 dollars or so, take a look at the Tower Adventurer 9’10” iSUP and the Isle Aristech 10’ iSUP. If not, don’t worry! You’re still getting a great package with the Solstice Bali, just without some of the bonus features — plus, the healthy 10’8” length could actually make this board more appealing, especially for beginning riders. If it sounds like this board might be the one for you, check out the rest of the customer reviews on the Solstice Bali Stand-Up Paddleboard page on Amazon, and remember to take advantage of their free shipping! 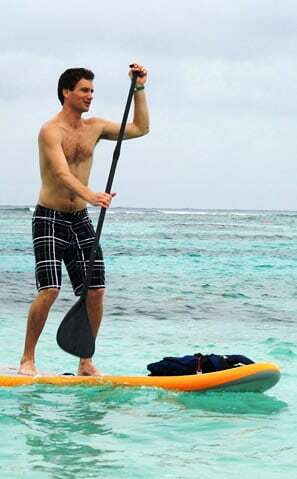 Have you tried the Solstice Bail Stand-Up Paddleboard yet? What is your favorite part of this SUP? Let us know in the comment section below. 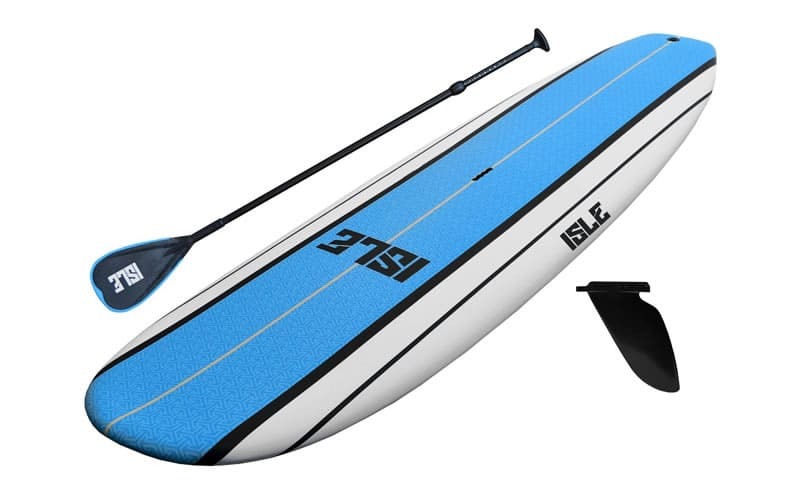 The Solstice Bali 10’8” Stand-up Paddleboard (SUP) manages to beat out even some of the most affordable inflatable SUPs on the market, while still offering great quality and pretty impressive package.